WASHINGTON — House GOP leaders announced Monday they were putting forward a “backup plan” that would extend the payroll tax cut for ten months, while cleaving it from a similar extension of unemployment insurance benefits and what’s known as the “doc fix,” a measure needed to prevent dramatic cuts in Medicare reimbursements. The plan would not be offset by cuts elsewhere, the announcement said, meaning the cost of the tax cut would be added to the deficit. The announcement, made quietly on a day Washington is digesting the president’s budget proposal, is a stark reversal. Senate Minority Leader Mitch McConnell (R-Ky.) took the floor shortly after the statement was emailed to reporters and spoke only of the budget. “Because the president and Senate Democratic leaders have not allowed their conferees to support a responsible bipartisan agreement, today House Republicans will introduce a backup plan that would simply extend the payroll tax holiday for the remainder of the year while the conference negotiations continue regarding offsets, unemployment insurance, and the ‘doc fix,'” said Speaker John Boehner (R-Ohio), Majority Leader Eric Cantor (R-Va.) and Majority Whip Kevin McCarthy (R-Calif.) in a statement. A Democratic aide familiar with the talks said that Republican leadership had privately conceded the issue in negotiations on Friday, though word had not leaked out over the weekend. “Whether the payroll tax cut moves separately or as part of the larger package, the Republicans have already said they will give up trying to pay for it by slashing medicare or with other harmful cuts,” said the aide. Enlarge image Kenneth D. Lewis Former CEO of Bank of America Corp. The Federal Reserve and the big banks fought for more than two years to keep details of the largest bailout in U.S. history a secret. Now, the rest of the world can see what it was missing. 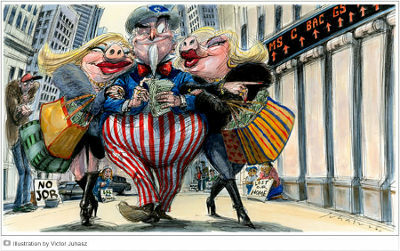 The Fed didn’t tell anyone which banks were in trouble so deep they required a combined $1.2 trillion on Dec. 5, 2008, their single neediest day. Bankers didn’t mention that they took tens of billions of dollars in emergency loans at the same time they were assuring investors their firms were healthy. And no one calculated until now that banks reaped an estimated $13 billion of income by taking advantage of the Fed’s below-market rates, Bloomberg Markets magazine reports in its January issue. VIDEO: Financial Services Subcommittee on Oversight and Investigations hearing of May 5, 2009. Republican House Speaker John Boehner has walked away from crunch debt ceiling talks at the White House with US President Barack Obama. Mr Obama said Mr Boehner had rejected an “extraordinarily fair deal” that would have included $650bn (£400bn) of cuts to entitlement programmes. The president said he had been willing to take “a lot of heat” from his party. Mr Boehner told a news conference afterwards that Mr Obama had “moved the goal posts” by demanding a tax hike. President Obama said he wanted a meeting with congressional leaders, including Mr Boehner, at the White House at 1100 (1500 GMT) on Saturday. This story has been updated to include additional reporting. WASHINGTON — After getting mocked by GOP operatives for launching an “offensive” on 25 vulnerable Republicans with minuscule ad buys Tuesday, Democrats are turning the tables with a new stunt aimed at putting some muscle behind their Medicare media campaign. And they’re doing it in the district of House Speaker John Boehner (R-Ohio). In an email sent to supporters around 9 a.m. Wednesday, the Democratic Congressional Campaign Committee Chairman Rep. Steve Israel challenged donors to pony up $25,000 by midnight — in order to run a pointed spot in Boehner’s backyard. It would mark the DCCC’s first TV buy of the 2012 cycle. “Let’s go big,” Israel writes, offering to splash the spot featuring an older man mowing lawns with his walker and doing a strip tease to afford his Medicare under the budget plan written by Rep. Paul Ryan (R-Wisc.) earlier this month. “After House Republicans rammed through a disgraceful budget that would end Medicare — while giving millionaires and billionaires another tax cut — we knew we had to have an eye-popping response,” Israel said. The gambit comes a day after the DCCC launched a radio campaign that the National Republican Congressional Committee derided as both a scare tactic and a joke. “[Democrats] are continuing to use partisan scare tactics and insist on the ability for Washington to continue spending money we don’t have,” the NRCC’s Paul Lindsay emailed reporters. $25,000 will likely impress the GOP a little more, especially in a district like Boehner’s where relatively small sums can go a long way. The publicity also will likely aid the DCCC’s effort to spread the ad further. Lindsay said he wasn’t tickled by the spot, and suggested the ad left out what was actually obscene — what he described as the Democrats’ unserious approach to the deficit. Democrats point to Congressional Budget Office estimates that say the GOP plan to shift seniors into the private insurance market with a voucher-like program will raise their out-of-pocket costs. In separate statements late this morning, both Harry Reid and John Boehner agreed that we are very close to an agreement to prevent a federal shutdown, but said an agreement had not yet been reached. Reid said both sides had agreed on the numbers, but that Republicans continued to insist on banning funds for family planning and Planned Parenthood. Boehner’s brief statement offered no specifics on the state of negotiations other than to say that he believed we were on the cusp of a deal. He offered platitudes about cutting spending, and urged the Senate to pass the House’s so-called “troop funding bill.” Boehner’s statement, which amounted to no more than three or four sentences, seemed to be focused more on keeping up the appearance of brinksmanship and maintaining support from his caucus than on actually addressing whatever issues remain outstanding. 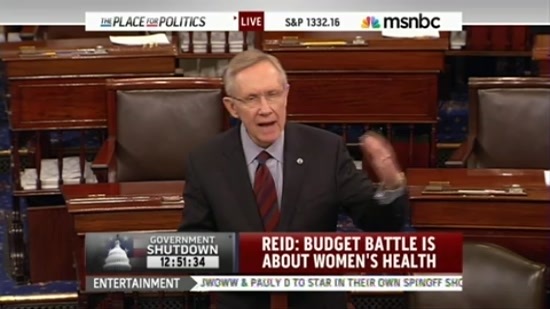 Reid said tea party opponents of Planned Parenthood and family planning funding had a right to debate their views, but that holding the government hostage was unacceptable. Assuming that a deal is reached today (and I bet there will be one), what will probably happen is that the Senate will take up the so-called “troop-funding” bill that House Republicans passed yesterday, and substitute a “clean” CR to keep government open for a few more days while the details of the deal are written into legislative language. Democrats have already put the House bill into the Senate calendar, making it clear they are contemplating this course of action. If the Senate passed the a clean CR, it would head back to the House, which could pass it later today. BENGHAZI, Libya — France declared Libya’s airspace “under control” on Friday, after NATO agreed to take command of the no-fly zone in a compromise that appeared to set up dual command centers and possibly new confusion. Coalition warplanes struck Moammar Gadhafi’s forces outside the strategic eastern gateway city of Ajdabiya. Representatives for the regime and the rebels were expected to meet formally for the first time Friday, in Ethiopia, in what the U.N. described as a part of an effort to reach a cease-fire and political solution. The overnight French and British strikes on an artillery battery and armored vehicles were intended to give a measure of relief to Ajdabiya, where residents have fled or cowered under more than a week of shelling and fighting between rebels and government troops. Explosions also could be heard in Tripoli, the Libyan capital, before daybreak Friday, apparently from airstrikes. “Libyan airspace is under control, and we proved it yesterday, because a Libyan plane in the hands of pro-Gadhafi forces, which had just taken off from Misrata in order to bomb Misrata, was destroyed by a French Rafale,” Adm. Edouard Guillaud said on France-Info radio. But the compromise that puts NATO in charge of clearing the skies still leaves the U.S. responsible for the more difficult task of planning attacks on Gadhafi’s ground forces and other targets. Ajdabiya has been under siege for more than a week, with the rebels holding the city center and scattered checkpoints but facing relentless shelling from government troops on the outskirts. Residents are without electicity or drinking water, and many have fled. The U.S. military said coalition jets flew about 150 on Thursday, about 70 of them with American planes. “The operation is still focusing on tanks, combat vehicles, air defense targets – really whatever equipment and personnel are threatening the no-fly zone or civilians on the ground in such locations as Ajdabiya and along some other areas on the coast,” Marine Corps Capt. Clint Gebke told reporters from aboard the USS Mount Whitney. The U.S. has been trying to give up the lead role in the operation against Gadhafi’s forces, and NATO agreed late Thursday to assume one element of it – control of the no-fly zone.